It’s been two weeks since Ohio State University Marching Band director Jonathan Waters was fired and the story has shown little sign of dying down. This week Mr. Waters finally broke his silence, appearing on The Today Show, Good Morning America, and Inside Edition to tell his side of the story. ABC 6 in Columbus also ran an extended interview with Mr. Waters which discusses various aspects of the university’s report. One of the things that impressed me about these interviews was that Mr. Waters did not just try to clear his own name but he also tried to defend the students and alumni who have been billed as sexual deviants by many in the media and online. Ohio State responded to these tv appearances by issuing a statement defending their decision, saying “The former director has yet to produce any factual examples that demonstrate any tangible attempts to change the band culture”. OSU also announced the interim directing staff for the marching band for this season. Professor Russel Mikkelson, Director of University Bands, and Dr. Scott Jones, Associate Director of University Bands, will lead the marching band this season in an overseeing role. Professor Mikkelson will be in charge of general oversight and direction for the band while Dr. Jones will be in charge of Title IX compliance and student safety. Lisa Galvin was hired as an associate director and will help current associate director Chris Hoch and assistant director Mike Smith with drill design, music rehearsal, and general day-to-day operations of the band. Other than hiring Mr. Waters back, this was probably the best outcome that TBDBITL alumni could hope for as there are a lot of connections to the marching band which should help ensure continuity this season. Dr. Jones is an alumni of the marching band and he and Professor Mikkelson have obviously worked with the band in the past in various ways. Mrs. Galvin is a former member of the marching band and has also served as a graduate assistant and arranger for the band over the years. We continue to get amazing letters and emails regarding the termination of Jon Waters and our coverage of it and we continue to share these letters and emails with you. Below are the thoughts of another TBDBITL alumn; as with all of the letters and emails we share on this topic, this one is presented in its entirety without any editing. As with the other letters from TBDBITL members that we’ve posted, we have at this time removed the ability to comment on this piece, although you can send thoughts to us via email. In an age where an ever critical eye has encouraged us to find and exploit even the smallest of faults in each other, long standing institutions are crumbling under shockwaves of judgment. As we strive to uncover weaknesses and errors in each other, our hypersensitivity has made us all but incapable of forgiveness and acceptance while camouflaging the truly unacceptable. We have nurtured such a paranoia of potentially offending someone that we ignore the individuals we supposedly seek to protect, placing our opinions before theirs in a fit of pure ego. Too often is the right to speak freely misperceived as a right to not be offended. This is the case of the Ohio State University’s gross mishandling of Dr. Jon Waters and the Ohio State University Marching Band. A prime news story in Ohio for the last week, the university’s publishing of a 23 page admonishment of the band’s conduct led to the firing of the most forward-thinking director in the band’s 140 year history. First, it should be made absolutely clear that sexual harassment and hazing are categorically unacceptable in any organization. This type of reprehensible behavior physically and psychologically damages individuals and should be treated with the utmost contempt. There is, however, a clear difference between the intentional harms suffered by sexual harassment and hazing, and pure-intentioned ribbing, devoid of malice. Our willingness to believe the worst in each other has rendered us incapable of understanding this difference. We continue to get amazing letters and emails regarding the termination of Jon Waters and our coverage of it. One of the questions that has been asked elsewhere during this controversy is whether you would want your son or daughter to be part of the OSU band now. We share a letter from the mother of a recent TBDBITL alumnus; parts of Liz Russell’s story were shared last season before the Michigan game. As with the other letters from TBDBITL members that we’ve posted, we have at this time removed the ability to comment on this piece, although you can send thoughts to us via email. It has been a little over a week since the firing of OSUMB Director Jon Waters. Over the course of that time, I have seen many letters written to you. I would like to take this opportunity to add mine. I am a band mom. “Band Mom” status begins early in life, usually by about the fifth grade. We are the roadies, the support team, the chaperones, the bus riders, the spat shiners, the hair fixers, the instrument buyers, the fundraisers, and the nurturers. We share the dream of our students in hitting their “big time”, a college marching band. 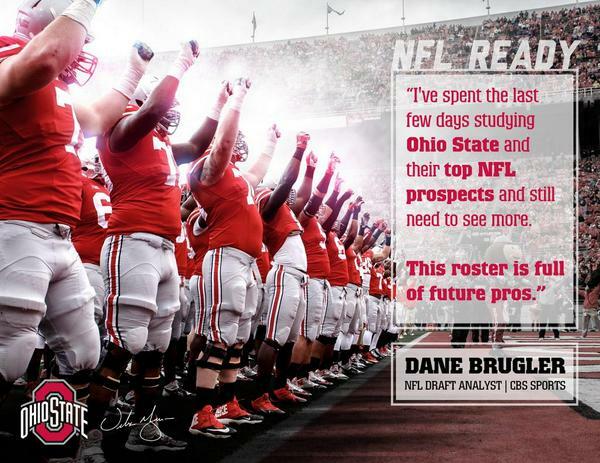 As you are well aware, there is no bigger stage than The Ohio State University for this. It is the standard of which other colleges aspire. My son is an Ohio State Marching Band alumnus. Because we live in Michigan, he grew up wanting to be in another Big Ten marching band. All his life he dreamed of the Big House and what it would mean for him to be there. At Michigan, he would have been a legacy, as I was the first female tuba player in that organization. Little switcheroo this week; with camp in full swing as of yesterday, here’s some notes and so forth from the start of Ohio State’s 125th Season. Inspired by Scott’s wise-acreage in our group chat this week, you’re stuck with this as your morning soundtrack. Ch-ch-ch-ch-changes- The University announced on Monday that the OSUMB will be led by two current staff persons for the coming season, with Ohio State’s director of university bands, Russel C. Mikkelson as the primary contact person. The associate director of bands, Scott A. Jones, will be coordinating student safety and compliance with Title IX and other university directives. TBDBITL Alumni Lisa Galvin will also be assisting in the day to day operations… So they tabbed three people to do the job they expected one person to do previously. Huh. Look! We’re On TV!- Jon Waters will be on both the Today Show and Good Morning America this morning. Getcha’ popcorn. Roster Updates- We told you about Tracy Sprinkle; Tommy Brown was also absent, as he is planning on transferring to another program (Akron?). J.T. Moore was in a “student coach” role, due to a knee injury. Michael Hill received a medical redshirt for last season, and will be a freshman eligibility wise for the coming year. Darron Lee was also granted a medical redshirt. Pay The Piper- Sprinkle will be suspended for the Navy game and have community service to complete before he’s fully reinstated, though, as was speculated earlier. One Flu Over- Gareon Conley sat out due to illness issues. For Kicks- Cameron Johnston was booming punts today, but shanked one when “Born In The USA” was blaring on the loudspeakers. We’ll just chalk that up to an international incident. Dontre Wilson, Jalin Marshall, and Corey Smith were on the receiving end of the punts for today’s practice. Captain, My Captain- Coach Meyer turned this morning’s pre-practice meeting over to Jeff Heuerman, saying “it’s your team”. Foreshadowing? Recovering Nicely- Braxton was “tired” today, but there’s no doubt in Coach Meyer’s mind that he’s 100% entering fall practice. The team will monitor his throwing though- a pitch count of sorts. Battle Tested- Two to watch this fall: Left guard is up for grabs, as are the safety positions. Underwood, Hale, Farris, and Price all fighting for the offensive line spot, while Bell, Burrows, and Powell are vying for the safety slots. Sonic Booms- According to those who were there, Coach Ash was the most vocal member of the defensive coaching staff today. Given that he works in the backfield with Coach Coombs, that’s quite an accomplishment. See For Yourself- The gang at 11W have practice videos, and you can hear the thoughts of the head coach at the official OSU site. Back In Black- It’s time for the annual whispers of a black alternate jersey for Ohio State this season. If it must happen, I wholeheartedly support Josh Winslow’s idea for the look (Hyde not included). This Is Gonna’ Be Fun- We love Michael Bennett hereabouts, but this story on his roommate situation makes it all that much easier to do so. As with the other letters from TBDBITL members that we’ve posted, we have at this time removed the ability to comment on this piece, although you can send thoughts to us via email. Ed. Note- In 2012, I was privileged to share The Game with my wife and brothers… no easy feat for a California resident. One of the highlights for me was Script Ohio, particularly given that the “I” was being dotted by an African American female for the first time. To now correspond with her and share her response with you is an honor I can’t quite articulate. For context: She was interviewed as part of the initial investigation; this is her response to the University’s leadership following that meeting and the subsequent report and decisions. I have spent a great amount of time the past few days weighing whether or not I should write to you. I ultimately chose to do so only because I felt my comments would add a unique and valuable perspective to the conversation regarding the recent dismissal of Jonathan Waters. Like several of my female colleagues in the band, my name was included in the 23-page report released last week. However, so far as I know, I was one of the few who were actually interviewed during the investigation. While I take issue with much of the report that was compiled by the university, my greatest concern was echoed recently by several of my female colleagues in the band. Many of us were surprised to find ourselves included in a list of “sexually explicit” nicknames. Even more surprising to me was that at no time during my interview can I remember being asked about the details of my nickname, the circumstances under which it was given to me, or, perhaps most important, my feelings about my nickname. While the authors of the report may feel confident in their ability to draw their own conclusions about the feelings, opinions and intentions of others without asking them, I would argue that in this case, their clairvoyance has failed them miserably. Thus, I feel it is my right and duty to clear up several issues about the fourth name listed in the report: Donk. Donk is not a malicious or offensive nickname. Donk is a person. Donk is a five-year member of the band, a former i-dotter, and a two-time squad leader of KL-Row, which also happens to be a predominately male row. Donk is a daughter, sister, friend, a woman and, most importantly, an independent, clear-minded person. Donk is not a moniker that was placed upon me without my consent, and it is most certainly not something of which I am ashamed. What angers me the most is that, in spite of my feelings, I along with several others on the list have been mischaracterized as victims of “sexual harassment” without being asked directly for our input. Never in my life have I felt uncomfortable being known as Donk. It has appeared on shirts, social media, in papers for classes; in the label I stuck in my band hat and on a piece of duct tape in my raincoat not because it is a joke, but because it is my name. It is who I am. Although when I say “never in my life,” what I really mean is never before last Thursday. I now find my nickname listed in myriad news reports as proof of the alleged horrible, sexually aggressive culture of the OSUMB. While I am just as disappointed in the media for not bothering to do their homework, I would hope that a report dealing with an issue as serious as terminating the employment of one of the university’s most visible, respected figures would have been undertaken with more care. In my five years in the band and since my graduation, I’ve discussed my nickname and where it came from with my friends, family, coworkers, bosses, alumni and random people passing me on the street. Odd then, that seemingly the only people who were uninterested in learning more about my nickname were those responsible for putting together a report about sexual harassment in the band. As you are aware, we closed comments on several of the “open letters” that we received over the past week, but allowed for folks to email us their thoughts and reactions. Here are some of the responses we’ve gotten in our inbox, some challenging, some supporting, all invested in this issue. I appreciate reading the letters written by former band members to President Drake and getting their perspective on the situation. It is sad that their band experience has now become public and turned into something bad in this “investigation”. I have worked with Jon Waters on numerous band concerts here in Wood County (held every 4 years). I remember on the last trip to Wood County before that game up north, he left an after-event gathering for volunteers to monitor the curfew of band members. I have went though a very similar experience in public schools and have retired because of it. This young lady has said almost the exact same things that my supporters said in my case. I am grateful that you have published this piece. I support Jonathan Waters and hope that he continues his fight to victory unlike me that thought it would give me piece of mind to give up and move on. It has not. Not one day goes by that I do not wish I would have fought on. This young lady’s letter was perfect. This society is so worried about offending someone that we are all offended. We at some point be responsible for our own feelings and thoughts and our own comfort. I wish I could express this thought better but I hope you know what I mean. It has been a week since Ohio State fired marching band director Jonathan Waters and the story continues to dominate the headlines while the controversy surrounding it grows. One of the questions that has been asked a lot over the last week has been “what was the complaint that prompted this investigation?” Yesterday we got the answer as the woman who filed the complaint with the university came forward to share her story. The woman reveals that in October of 2013 her daughter, a fourth year member of the marching band, was sexually assaulted at an off campus party by another member of the marching band. The victim reported the crime to the police but ultimately chose not to press charges. The victim also reported the incident to Jonathan Waters who promptly investigated and turned his findings over to the university. On October 12th, after a hearing in front of a student judicial panel, the perpetrator was expelled from OSU. Eight months later, the mother of the victim filed a complaint with Ohio State regarding the band’s sexualized culture (full details and quotes from the mother can be found in the link). My first reaction upon hearing this was anger, Mr. Waters had nothing to do with the assault which occurred off campus and which was only connected to him because both parties were in the marching band. Waters took the appropriate course of action, investigating and quickly turning his findings over to the university which chose to expel the assailant. Why would anyone blame Mr. Waters for this? Sure, the mother said that she was upset that Mr. Waters never said he was sorry but it wasn’t his fault and it is likely that OSU’s lawyers told him not to say anything like that as it could easily be taken as an admission of guilt and thus, open the university up to all sorts of legal trouble. However this incident really cannot be blamed on the band or the band culture, rather it is a symptom of a much larger cultural problem on college campuses across the country or even a problem with aspects of American culture in general which desperately need to be addressed. We continue to get amazing letters and emails regarding the termination of Jon Waters and our coverage of it. On Friday, we’ll be running several more of your remarks, but thought that this account should be read on its own, particularly given the news of the day.As with the other letters from TBDBITL members that we’ve posted, we have at this time removed the ability to comment on this piece, although you can send thoughts to us via email. The past couple of days have weighed heavily on my heart as I have witnessed an organization (and individual) that I have held so dear to my heart be exposed, insulted, mocked, persecuted, misrepresented, and finally dismantled by the very alma mater that I believed was dedicated to the betterment of that same organization, its members and the community around it. What I have witnessed over these past couple of days has led me down a path I never thought possible, questioning my allegiance to a University that has been in my heart since I can remember even having the ability to remember. While I did not grow up in Ohio, my parents (both Ohioans) raised me on the core values that I believe were instilled in them by such a great state and its leading university: discipline, loyalty, scholarship, benevolence, family (actual and metaphorical), and empathy. I emphasize the latter two core values because I believe they are especially important in the context of these recent events. My first true encounter with The Ohio State University Marching Band is undoubtedly similar to many others. I was five or six years old, travelling from Las Vegas to Columbus to go to my first Ohio State game with my father and grandfather. Times were different back then. I learned that my grandfather had never attended college because of his need to support his family and play a role in World War II. Similarly, my father, whom I thought had graduated from Ohio State, was forced to graduate at another institution due to his required military service at the time. Nonetheless, their allegiance to this great university was unwavering, and had been impressed upon me from minute one of my existence. Upon arriving in Columbus, it was a typical grey and dreary fall day with the leaves changing, the clouds hanging over and rain looming. Our first stop was high street, where they took me to Buckeye Donuts to drink hot chocolate and play connect four before walking around campus and showing me where my mother attended her classes as a student some twenty years earlier. The trees and buildings were beautiful and nothing like I had seen in Las Vegas. All of the fans and students were so excited just to be alive, engaging in another great Saturday of college football and festivities. It didn’t feel like it was about winning or losing, or being number one, but just being a part of a great institution during truly great activities on such a great day. As I continued around campus, this pride echoed through the hallways of every building and resonated in the tone of every voice. The next stop was St. Johns Arena, where my father began to tell me stories about the band. I remember him saying “If you listen real close, you can hear the band coming. Listen for the drums.” I sat and listened, eager to be the one that heard the band first. The fans would start to clap and die down, and clap some more. Then, out of nowhere, the entire Arena erupted into screams and applause, and with a quick exit, the band came out, so crisp, so clean, so pristine. The quickness of the steps and movements, I remember, were so precise that I could barely contain myself. And then they played.